A new way to target a breast cancer cells appetite for over-indulging in sugar, that could provide an alternative treatment for chemotherapy resistant breast cancer, is being developed by Breast Cancer Campaign scientists at the University of Southampton. The treatment exploits a novel link, identified by the scientists, between sugar processing in the cells and their growth and division. This approach to treating breast cancer offers a real alternative to chemotherapy as it targets the active cancer cells and not normal cells, reducing the risk of side effects that affect thousands of women undergoing treatment. 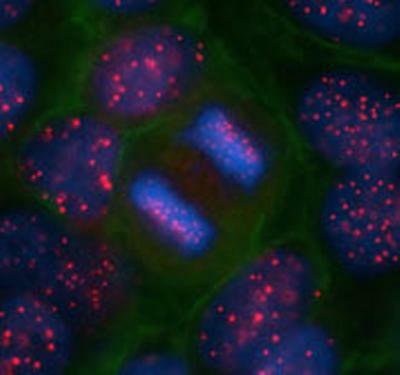 Dr Jeremy Blaydes and Dr Ali Tavassoli at the University of Southampton, have shown for the first time that chemicals called cyclic peptide inhibitors can stop ‘sweet toothed’ cancer cells from growing and multiplying by blocking proteins in the cells called CtBPs (C-terminal binding proteins). A key feature of cancer cells is they gorge on sugar from the blood, greedily processing it as a fuel supply which triggers CtBPs to bind together, forming pairs known as dimers that enable cells to grow and multiply out of control. In unique laboratory experiments, Dr Tavassoli's lab developed a number of chemicals designed to block CtBP dimers from forming. They then in collaboration with Dr. Blayde's lab selected the most effective chemical, CP61, which they are now developing into more drug-like molecules, which may one day be used for treatment of breast cancer. Dr Blaydes comments: “Because this is an entirely new approach to treatment, the drugs we are developing could be effective against breast cancers that have become resistant to current chemotherapies. Unfortunately, despite great improvements in breast cancer treatment in recent years, chemotherapy-resistance eventually happens in around one in five cases (20 per cent), and every year in the UK around 12,000 women still die from the disease. To overcome this resistance, innovative treatments that use new approaches to stop cancer from growing are desperately needed. “What makes this discovery even more exciting as a potential treatment is that CtBPs are mostly only active in the cancer cells, so blocking this ‘sweet tooth’ should cause less damage to normal cells and fewer side effects than existing treatments. Dr Stuart Griffiths, Director of Research at Breast Cancer Campaign, adds: “For women whose breast cancer has become resistant to chemotherapy, this potential new treatment could offer a much needed life line. “In 2003 Dr Blaydes’ pioneering CtBP research was identified by Breast Cancer Campaign as a project with huge potential to save and improve lives. Continuous investment in this research has brought us to the brink of a potential new treatment for people who desperately need an alternative to chemotherapy in order to increase their chance of survival. This project was partly funded through Breast Cancer Campaign’s partnership with Asda and it’s Tickled Pink campaign, Debenhams Think Pink campaign and The Generations Walk. The findings were published in the August issue of Chemical Science.